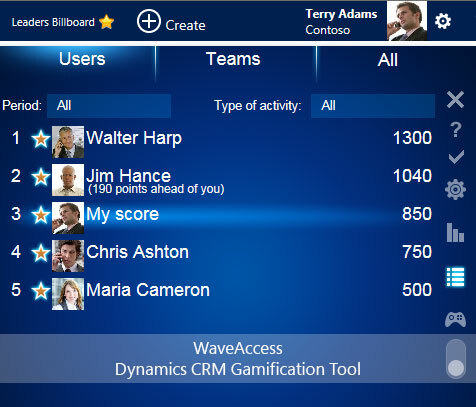 CRM Gamification Tool: increase Microsoft CRM user adoption! Want to measure and increase Microsoft CRM user adoption rate? Turn it into a Game! If you have faced a situation where people don’t want to use Microsoft CRM, or they don’t want to enter any data in it, you might be looking for a way to motivate them. 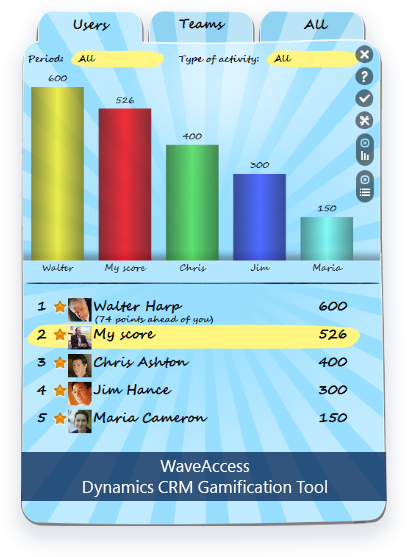 That’s where WaveAccess' Gamification Tool comes in. By embracing the increasingly popular digital gaming trend, not only can you increase CRM user adoption, but you can also measure how much CRM is used after installation of Gamification Tool. Our solution is shipped with out-of-the-box charts and dashboards that display how many points are earned for main operations (such as creating/updating accounts, opportunities, activities and so on) by users, teams or by entire organization. 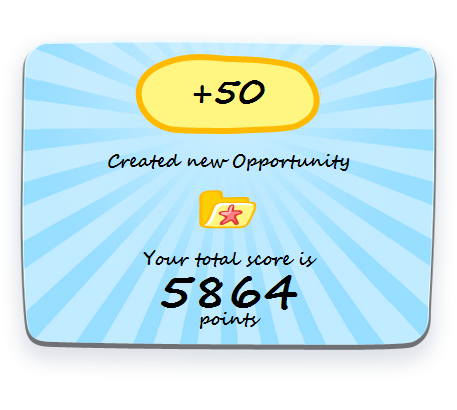 So, after you install Gamification Tool and it starts measuring the results, you will be able to see Gamification in action. Microsoft CRM has never been so much fun. 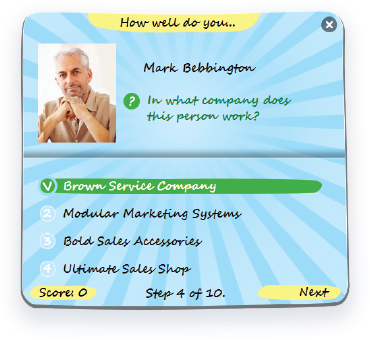 How to have fun working with CRM Gamification Tool What are the features? A user gets points for each “create” or “update” operation in CRM (create a lead – get points, complete a task – get points and so on) that are immediately displayed in a special balloon in the browser window. There is a special leaders’ board where the top 5 players are listed. This leaders’ board also displays the user’s score. It also displays the closest player and the gap in points between that player and the user. With the ability to create events and conﬁgure them; you can create dashboards for special event; edit the list of participants and the list of entity ﬁelds for which points are added. 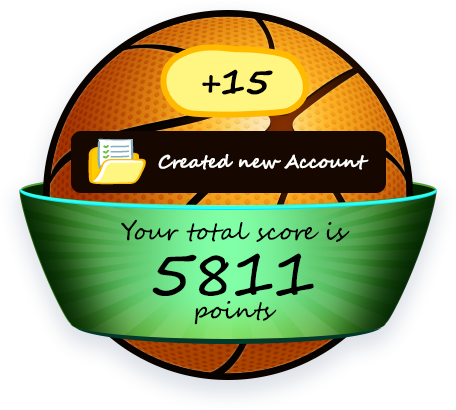 Earned points bring users respect and special titles. They can progress from novices to grand masters. The titles are depicted on the leaders’ board in front of the users’ names. A customizable set-up allows you to control ways to encourage and reward (For example if your sales team isn't making enough phone calls you can assign a high point value to making phone calls). You can pick and choose the 'players' – for example, just the highly competitive sales team members can be in the game, and you can leave the rest out! Track results of the competing teams and users in real time using a special comparison form. You can also ﬁlter results by the type of activity, selected period or ﬁltered by event and output them as a histogram, or traditionally as a list, or combine them. 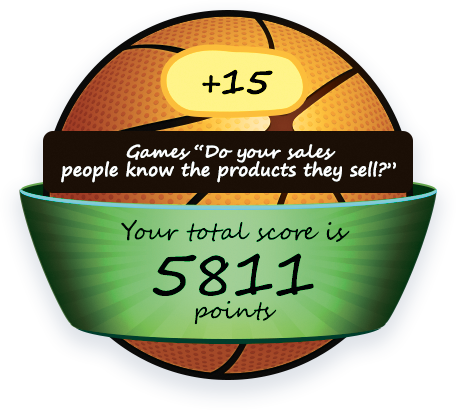 The Gamification Tool can be personalized with your corporate branding. Add your company logo, or style your Gamification with a corporate identity by creating unique design elements. 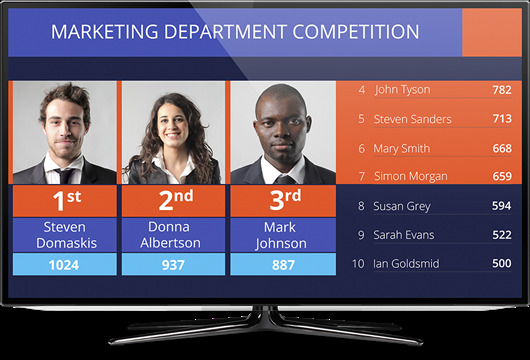 TV-broadcasting functionality provides tracking results of the competing teams and users in real time on the TV screen. 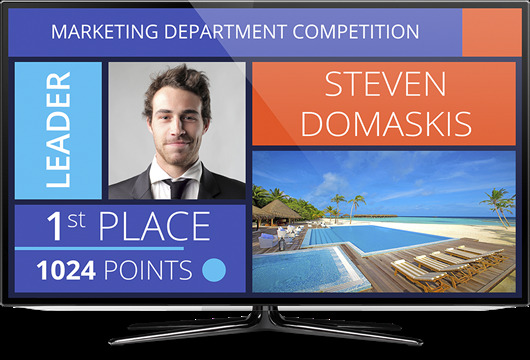 The big screen displays three pages which endlessly follow each other and show information about a prize and the top 10 players and leaders’ board. 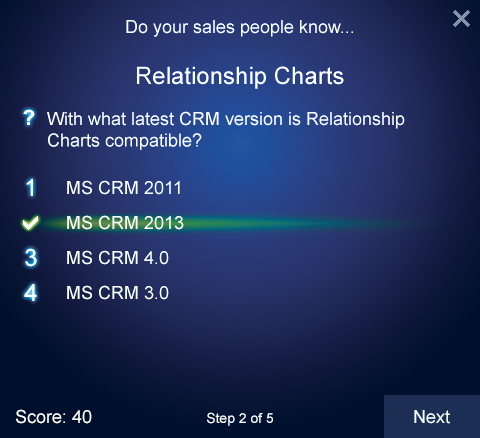 Get the most from your MS CRM! 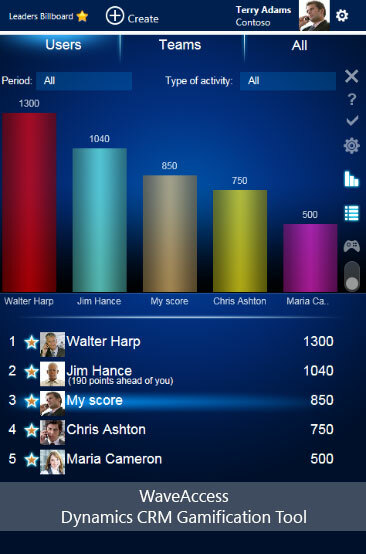 Measure user adoption and significantly increase it with the CRM Gamification Tool. Have you ever been in a situation when you engaged a person and thought, “I wish I knew more about him.”? Do you remember what your customers look like? Do you know their current job position? Of course, all information about your customers is already stored in CRM, but do you know this information? Now you can learn some valuable facts about your customers when you have five minutes between calls. 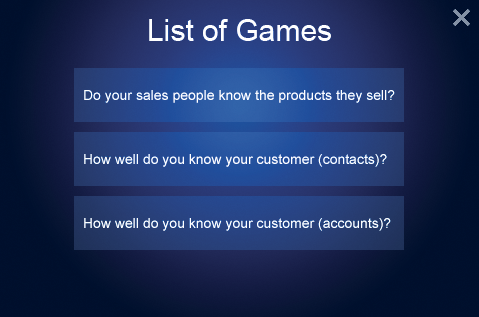 There is a Game that will show you pictures of your customers and ask you questions about them. When your answer is correct you get points. Questions in the Game can be generated over any custom entity. Specify the questions and turn "Would you like to know your customer better" into, for example, "Do your sales people really know the products they sell?" with items like "Does the product CRM 2013 support server side exchange integration? Yes / No". 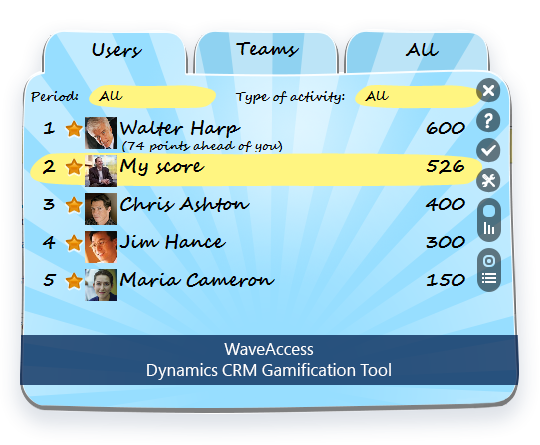 The Game is a new feature of WaveAccess' Dynamics CRM Gamification Tool that we are constantly improving and developing. Install a 30-day free trial with a few clicks through the App Store. Platform: CRM 2015/CRM 2013/CRM 2011/Dynamics 365/9.0 online/on-premise. If you have not found the feature you need, let us know and we either will include it in a future release or develop it specially for you. Also, branding and personification can be done on demand. Contact us now! Increases involvement of your sales team, making them more interested in finishing assigned tasks. An understandable system of evaluating progress – all of your sales team (not just the "favorites") can compete for promotions and raises, and they all know what they need to do to get it. Motivates the sales team to completely fill in data and update their CRM data, which will reduce the company's dependency on one sales team member. And this way, all of his contact information and work will stay with the company. Why would I need to increase CRM adoption? Better CRM adoption means more valuable data in your CRM. Very important information such as connections that exist between your customers and your users is missed in CRM. Each sales person knows only his customers and cross selling becomes difficult. Also sales people do not create records about meetings and phone calls. It is tough for sales management to get an accurate picture of the current opportunities and provide valuable data for customer analysis. But, getting all pertinent data into CRM will make it possible to better understand customers and eventually to get more deals done. Why will CRM gamification help improve user adoption? Usually, the competitive spirit in a sales team is raised by creating a monthly sales plan. However, this method of motivation usually falls short of expectations. Beyond that, however, evaluating the value of an employee based only on the value of sales they've made in a month can, at times, not illustrate the quality of work done that month. 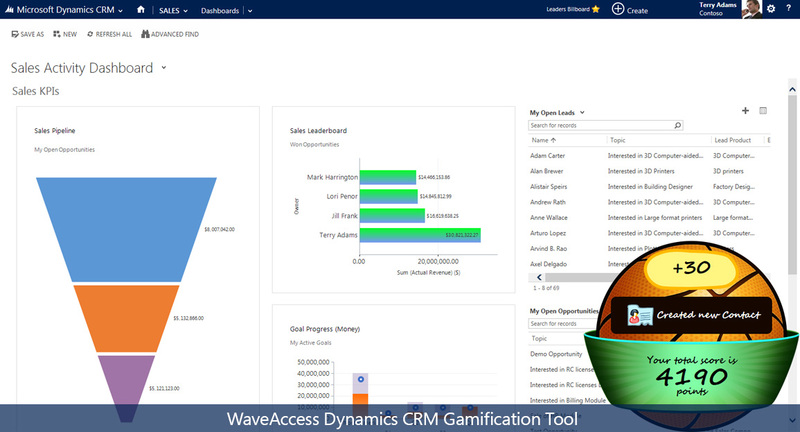 WaveAccess' Gamification CRM allows you to track more metrics and will increase competition in your sales department in a meaningful way. All of which will lead to improved CRM adoption and increased sales in general. After you motivate your sales people to enter data in CRM, you will be able to analyze how many calls a sales team member makes in a week, how many meetings they go to, and how long it takes them to complete a sale since the moment of first contact with the client. Assign a point value to all of these categories and you will get a 'rating' and all of your sales team members will have a 'score' in the game. 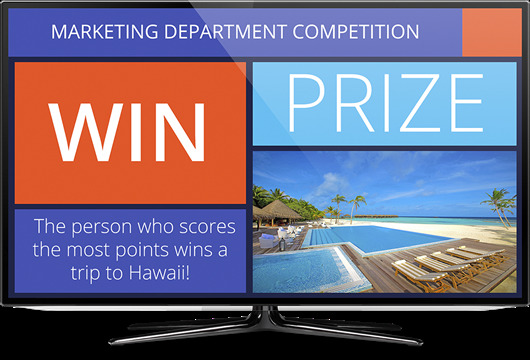 As the scores change over the course the month, your sales team will start competing with each other to get the 'high-score'. And for all of this to happen, their work will need to be of the highest quality. 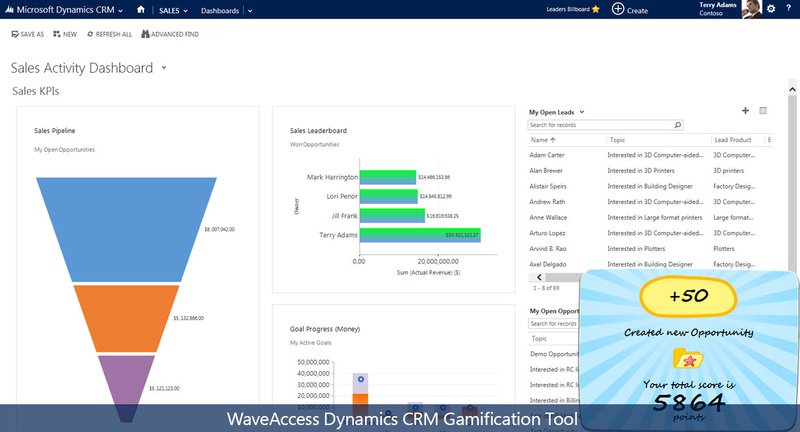 For the whole year, our partners get 40% commission when they sell the Microsoft Dynamics CRM Gamification Tool. Engage your clients in the game, add some fun to their everyday routine operations and increase customers’ CRM user adoption with the latest trend of Gamification! Meet your customer needs to leverage your income!